Call us crazy but if we were to set up a restaurant on the 21st floor of a building which overlooks the gawk-worthy dazzling Hong Kong skyline, we’d renovate the space to maximise the view. We would have full-length windows and tables which allow diners to take in the spectacular city sights while they’re enjoying their food. So it’s a little befuddling when we find that new fine Japanese dining spot, Sushi Tae, has blocked its moneymaker by setting the sushi and sake bar in front of the windows, rather than putting the tables there. We’re not saying it’s not a beautiful set-up. The metallic shelves stocked with sake bottles and Japanese knickknacks gleam with a sophisticated steeliness that, along with the grand white walls, really ups the chic ambience and resembles a fine French bistro more than it does a Japanese restaurant. And, in its defence, there’s a spacious outdoor patio from which guests can fully enjoy the cityscape over an alfresco meal. But, inside, we’re disappointed the eatery hasn’t maximised its ‘wow factor’ potential. However, if what you’re aiming for is a bit of intimacy, Sushi Tae has that in spades. The restaurant offers some cosy corners for old friends to catch up or couples to enjoy quality time together. The staff are also quite attentive so don’t worry about running out of tea. 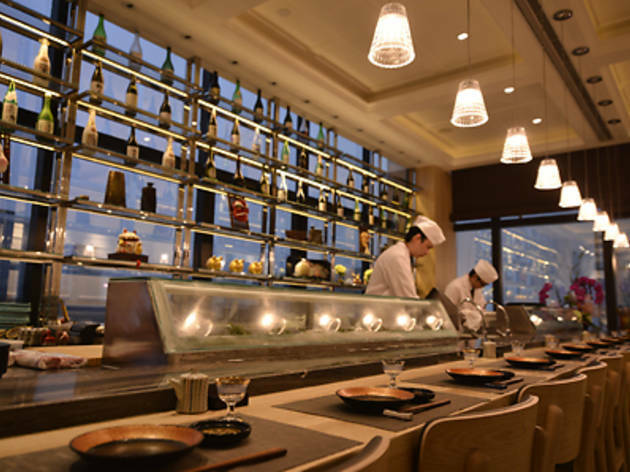 And if you opt for a seat at the sushi bar, you’ll receive close attention from the jubilant chef Lau Chun-wai, who, with more than 30 years of sushi-making experience, understands that it’s just as important to entertain your diners as it is to slice good fish. Sushi Tae’s highlights are its omakase menus (‘omakase’ is Japanese for chef’s choice). Diners can choose the $700 ‘half-moon’ course, $900 ‘full-moon’ course or the grand $1,200 ‘mon mitsuru’ course. We go for the mon mitsuru set, which has 11 pretty balanced offerings of sashimi, grilled meats and warm bowls of soup and noodles. The meal starts refreshingly with a plate that includes poached Babylon snail, sake jelly and sweet yam. We especially delight in the cool jelly, which fragrantly bursts in our mouth, an unexpected but pleasantly wholesome mixture of texture, temperature and taste. For the raw fish fare, we’re treated to slices of red snapper which are mildly flavoured with ponzu sauce, as well as sweet and pearly botan ebi, generous slivers of fatty toro and silverfish. In the cooked corner, we chow down on grilled kinki fish, although it sports a bit too many bubbles of fat. The well-cooked yellowtail, however, is top notch. The quality of the fresh seafood is evident in each sliver. The same can be said for the sushi selection as we sink our teeth into a plate of gooey uni, chewy scallop, layered grilled hamachi yellowtail and mackerel – all really generously portioned out on soft fluffs of sweet Japanese rice balls. All the dishes are good but nothing out of the ordinary. Sushi Tae kicked it up a notch with their wagyu beef. Well-presented on a scalding hot stone, we’re served four succulent slices. Sprinkle a smidgen of salt on the beef as it cooks before digging in. Each bite melts heavenly in your mouth. This is the star of the night. For dessert, Sushi Tae offers an Ovaltine mousse that sounds like a treat but because it sells out rapidly during our evening, we settle for the crème brulee – not a bad consolation prize at all. A satisfyingly creamy ending to our meal. 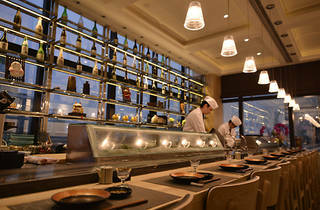 Sushi Tae 21/F, Hillwood Ctr, 17-19 Hillwood Rd, Tsim Sha Tsui, 2737 2309. Mon-Sun midday-2.30pm, 5.30pm-10.30pm.